Coconut Fried Cauliflower. [with sweet & spicy dipping sauce] | Eat More Plants. 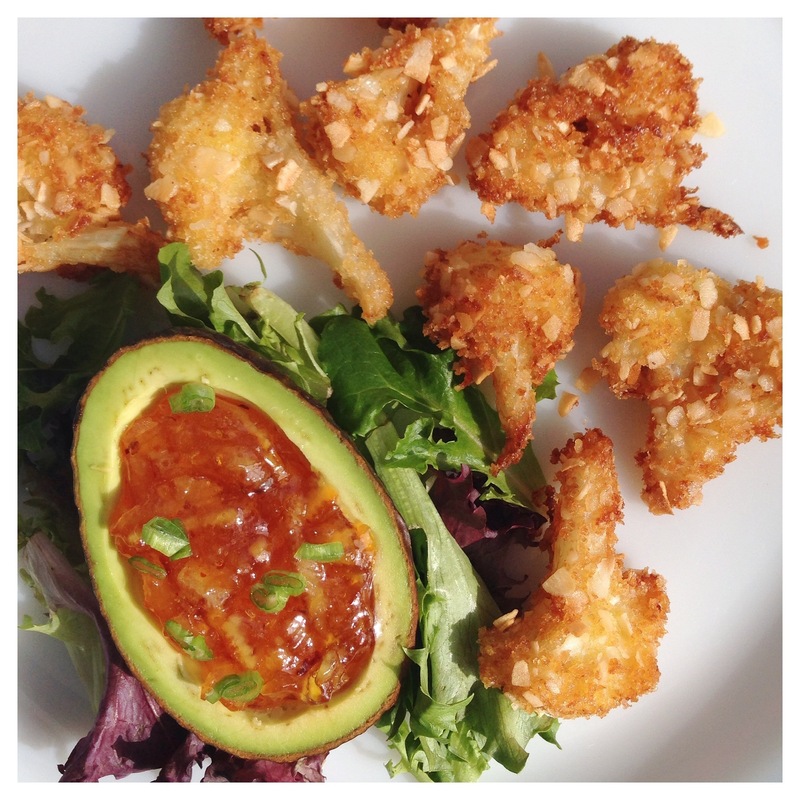 I have to seriously thank Cara from Fork & Beans for making me drool over these crispy cauliflower bites and inspiring me to cook some up. Truthfully, I’m not a big fryer. The only thing I used to fry on a regular basis was fish, so I did it in the same style: egg wash and bread crumbs. Cara used a flax egg, which is what I’ll try next time. Our hens just started laying again (because of the extra hours of daylight we’ve gained back!) so I wanted to use one of their beautiful, fresh eggs for this. Keep in mind this is one of those instances where veganizing does not equate to healthiness. But hey, you gotta treat yourself sometimes right?! First, I got my dipping sauce started. Mix all ingredients in a small saucepan and warm over the lowest heat possible. Let simmer for 12-15 minutes to blend all the flavors, stirring occasionally. While the sauce is simmering, slice 1/2 a head of cauliflower into thin florets. The thinner the better so they’ll brown evenly in the oil. Steam your florets for about 6-7 minutes, just enough that you can pierce them easily with a fork but they still hold their shape. 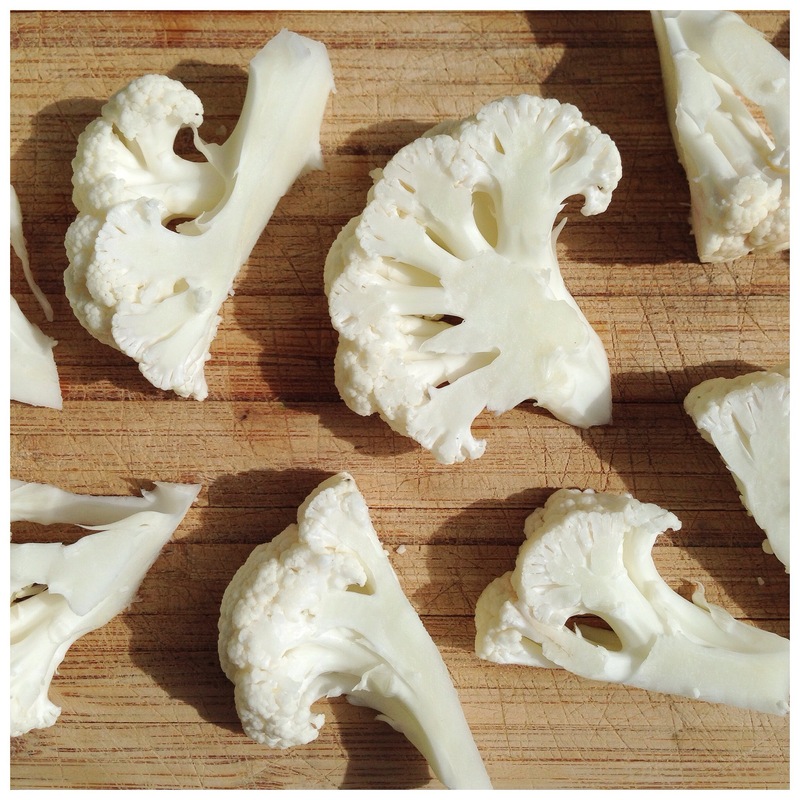 When the cauliflower is ready, dump it onto a paper towel lined plate to absorb any moisture. The dryer and cooler, the better. Any moisture left on the cauliflower will cause the egg or flax wash to not adhere to the florets. Mix all ingredients and let sit for 5 minutes to thicken. I used 1 extra large egg and 1 tablespoon of soy milk whisked together. Process all ingredients in a food processor until evenly blended. My shredded coconut comes in fairly large shreds so I like to process it until it gets small enough to stick to the batter easily. 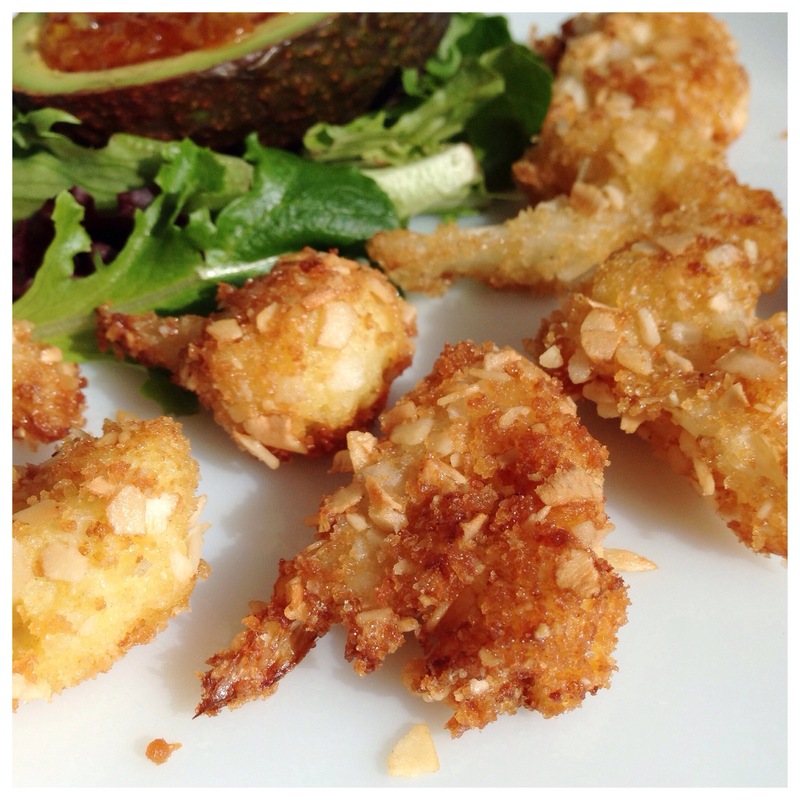 Big chunks won’t fry evenly alongside the small panko bread crumbs. Pour the bread crumbs into a small bowl and have a large plate ready to place your dredged cauliflower bites on. Heat up about 1/2 inch of oil in a large skillet over medium-low heat. Dip your florets one at a time into your egg or flax wash and let the excess drip off. The dredge it in the bread crumb mixture, pressing the crumbs firmly to the cauliflower making sure they stick on. Set them on the extra plate until you have enough to fill the skillet. Test the oil to see if it’s up to temperature by dropping a pinch of bread crumbs into it. If it immediately starts to sizzle, it’s hot enough. Lay some florets into the oil, taking care not to crowd the skillet. Let brown for about 2 minutes on each side. Serve with your sweet & spicy sauce.